What type of Internet connection do I need to have to use your service? Our service is an application that makes use of your Internet connection, much like a web page or e-mail. Like with those applications, the quality of your phone experience will be directly related to the quality and speed of your Internet connection. With a wired broadband connection like DSL or cable, your calls will sound crystal clear. Just give us a call or drop us an email to get started. If you already have compatible phones we can usually get you up and running the same day. Our phone service is competitively priced with other VoIP providers. Your startup and monthly costs will depend primarily on the number of phone numbers (DIDs) and extensions that you require. Most of the features of our phone service are included at no extra cost on all phone system plans no matter if you have a simple system with one phone number and extension to over one hundred phones with dozens of numbers. See our pricing guide for more information. Do I need an IT specialist to get this working? No. If you can un-box a phone, give it power and plug it into your Internet connection you can use our phone service. If you've purchased your phone from us it is that simple. We will send all your phones pre-configured so that all you have to do is plug them in. It couldn't be easier. We offer several different ways to use our service. We offer month-to-month, 12-month, 24-month, and 36-month service contracts. Can I pay for the equipment outright or can I just make a payment on it? You can either buy the system upfront or easily lease with us. Do I have to buy my phones from you? You do not have to buy phones from us, but we have a list of supported phones that can be autoprovisioned others would need manually provisioning contact us for more details. We believe that we offer a great selection of business phones at very low prices, but if you find phones elsewhere you may still use them with our service. Can I use your service for my home phone? Our service is primarily geared towards business owners. However, if you are running a business out of your home and have a sufficient Internet connection (see above), then you're good to go. Another option we offer is to have your home phone configured as an extension off of your business phone system. In this case our service may be a low-cost option for your home phone service. What area codes do you support? We can port numbers from any UK dialling code. If you want a new number we have area codes available from all parts of the country as well as most foreign countries. This means that if you have friends, relatives, or business contacts in other parts of the country we can supply you with a "local" number in those areas. That means callers can contact you with a local call. We can also obtain numbers in most countries so please contact us for more information. How many phone numbers can I have attached to my account? I've used Vonage before, What makes your service different? While our telephone service is voice over IP it uses business class technology that is quite different than Vonage. We use premium quality routes to provide the best sound quality and reliability for our customers. We also work with several termination providers which means that your calls will always get routed. If a call doesn't complete with one carrier our system will try the others until your call goes through. 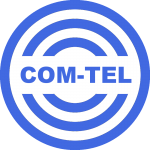 In certain cases COM-TEL Telecom will offer business class customers a free no obligation 1 week trial to try out the service. This is for customers in certain areas. Please contact us or speak to your sales representative to find out more about our trial. What type of equipment do I have to have to connect my phone(s) to the Internet? We recommend a business class router or firewall put in front of your phone system. If you have one or two phones any cable or DSL compatible router should be sufficient. For the best experience we have a list of tested and compatible routers that we recommend. Please note that you should never put a VoIP phone directly on the Internet (such as connecting it directly to your cable or DSL modem without a firewall or router). Doing so will ensure that your phone will be hacked within a matter of hours and the hackers will start running up your bill. We've seen it happen with many other carriers and if it does you assume all liability for the call charges. If you're not sure please contact us and we will advise you on your connection type.